Gorgeous and brilliant cut glass Czechoslovakian perfume bottle will grace your dressing table in vintage art deco style. The bottom of the bottle is a lovely cornflower blue color. The low inkwell-shaped base is eight-sided and a perfect complement to the design cut into the glass – an octagonal (oct) hobnail or cane cut. The bottom of the piece is marked with a worn navy blue and silver label. Difficult to read, I can only discern: Merchandise Mart Chicago Made in Czechoslovakia. There is a round acid etch mark on the bottom as well: MADE IN CZECHOSLOVAKIA inside a circle (see photo three). The top / stopper is made from a panel of clear glass cut in the same octagonal hobnail pattern. 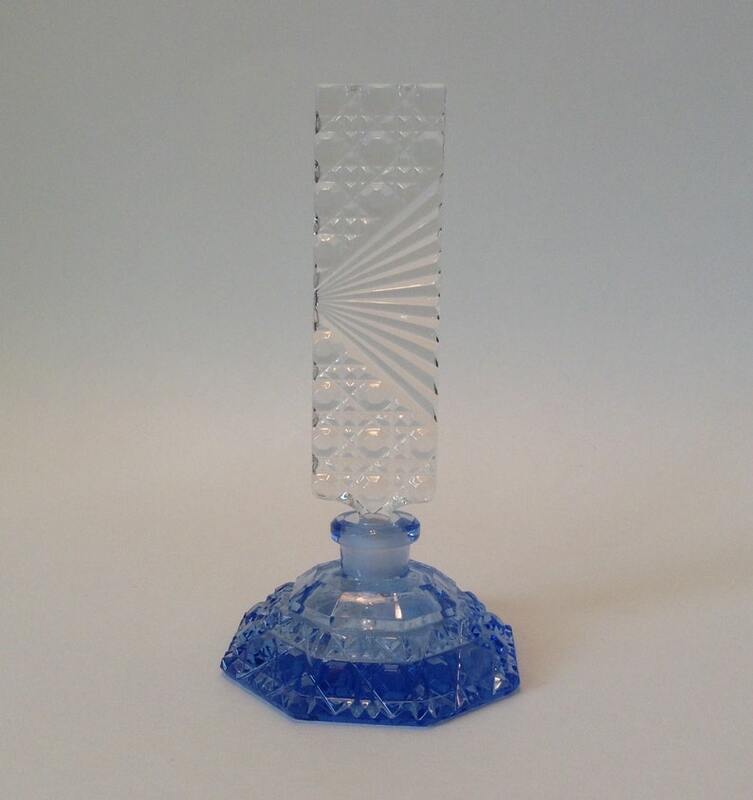 In the center of the top / stopper is a beautiful ribbed fan / triangle cut into the glass adding dimension and interest. The bottle and top / stopper fit well together. The bottom measures 1 1/2" tall by 2 15/16" wide and deep at base. The top / stopper measures 5 1/8" long by 1 1/4" wide by 1/4" thick. Total height of piece with top / stopper inserted is 5 5/8" tall. The piece is in very good vintage condition. There are no chips, cracks or repairs to the bottom of the bottle. I do see one or two minute nicks at the smooth top band edge but they appear under magnification to be somewhat polished and may have been part of the manufacture. The top / stopper shows some roughness at the back bottom corners – two flea bites on one side and a very tiny chip on the other – the damage is more felt than seen. The dauber is attached although somewhat short and a little rough on the tip indicating it may have been longer at one time (see photo four).